Episode 74 – Bearded Clam Challenge Winners! Where does the time go? Three years of Cocktail Hour, wow. To help us celebrate, we’re announcing the winners of the 2013 Bearded Clam Challenge! We had three great entries and we’re thrilled to be able to share them with you. We’re including epub, mobi, and PDF versions of the compilation for your enjoyment. Please be sure to share your love with the authors. They all did a fantastic job! We were joined by super special guest, Susan X. Meagher! Yeah, I know, it seems like she’s on the show all the time – which is just fine with us. She hung with us through LOADS of technical difficulties. A HUGE thank you to Andy who had an incredible amount of editing to do. You rock, sister! Since we didn’t have any books to beat out of an author, Andy and I are going to give one lucky listener their choice of either a mug or a cocktail shaker from the Cocktail Hour Store. 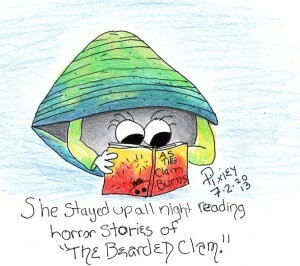 Just leave a comment here letting us know what you loved about the stories in the 2013 Bearded Clam Challenge. The authors worked very hard on these stories and we know that they’ll appreciate hearing from you. So give up some comments about the stories by SXM, Jove Belle, and Norsebard and you’ll be entered to win! Post your comments no later than September 19th and we’ll announce the winner on the next show. We’ll let Barbara Ann Wright pick. Until next time, go read and comment! OMG went on too long! I am so sorry!! LOL Thanks for the fun surprise of the picture being on the cover of these awesome stories!! I can’t wait to read them! Congratulations to the authors and thank you so much for all the hard work!! I can’t wait til next year! Congrats to Cheri and Andy and all the crew at Cocktail Hour for such a fun ride and all the super hard work too! You all rock!! Love you tons!! What a treat! No housework has been done, one break to go to the loo, otherwise couldn’t put my iPad down. Three excellent stories. I’ve read all of Susan’s work and she’s already one of my favourite authors. Now I have two other authors to add to my list. I was particularly impressed by Rebound, Norsebard is a natural storyteller. However, many thanks to all three authors for sharing their hard work – much appreciated. Pix, Angela, and Amy thanks for the support and love we really appreciate it. Nikki, I just can’t wait to love on my dragon. If they weren’t so damn cute I wouldn’t care. Smootchies everyone. Great anniversary show! Congratulations on 3 years and I’m looking forward to hearing more. I love hearing your perspective on new books in such a fun way with the authors. Andy, thanks for randomly picking #3! It is my lucky number. Can’t wait to get a signed copy of Second Nature from Jae. Hopefully I can read the bearded clam stories this weekend. They sound great! Excellent Show! I am excited to have won the mug!! Just downloaded the challenge. Thanks Rev for making this ebook ready! I hope to be able to read them this weekend. Congratulations on three years! looking forward to many more and all the shows involved with Cocktail Hour! Thanks for all your hard work! Susan, I am looking forward to your bearded clam story and the new book you are working on. Please come back and tell us more when it is ready!!! Great show, as always. Love to listen to SXM, as well as read her stories. I look forward to reading the entries. And Andy: Thanks for putting up with my live texts as I was listening to the podcast. Just what you want to do on a Saturday morning. Congratulations on 3 years! Keep up the great work, we really appreciate the time that goes into organizing and running all of this. These stories are excellent. Although, I would expect nothing less when showcased here. Thanks! Congrats on 3yrs. Congrats to the winners of the writing challenge. Great stories, I’m amazed how many different directions they can go with those 2 phrases – recently read the previous challenge winners too. Thanks all for picking my name, looking forward to the mug. That is an awesome cat and I love cats.